Rehearsals are taken very seriously at Cirque Du Soleil Kooza. George Fisher once said, “When you aim for perfection, you discover it’s a moving target.” Well, the performers at Cirque Du Soleil Kooza are excellent marksmen. 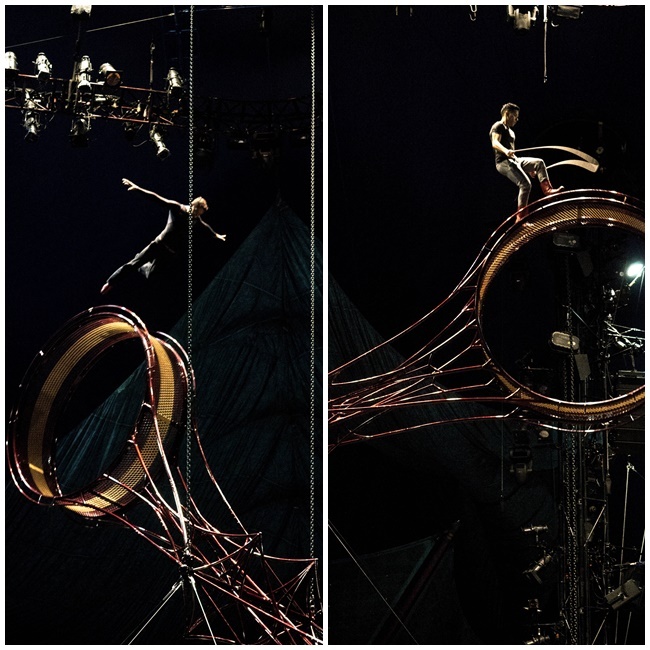 Every night of their spectacular showing, they have attained the equivalent of an Olympic gold in the world of theatrical ingenuity and acrobatic wonder. Before they arrive in Singapore, we had the exclusive chance to spend a day with the troupe in the misty cold of Perth, Australia. Join us as we take a journey through their everyday – the training, the make-up and all the beautiful costumes of wonder. Inside the big top, quiet and bright. 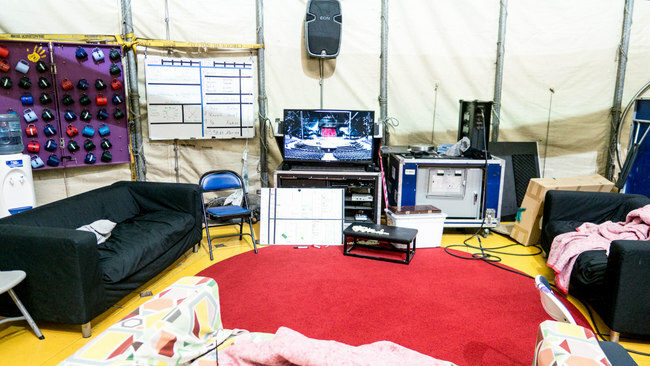 Each performer has an allocated set of time to do their rehearsal before the show at night. Excitement, bubbling. I was about to see the whole of the circus. The guide skipped pass the iconic yellow and blue big top, leading us to the trailers where performers rested or got ready. If you thought the main stage was huge, wait till you walk back here. What caught me eye, almost instantly, was the mini bar, laying in wait (priorities, am I right). Still, a sudden realisation of how much work goes into every show, every night, hits me. It is just two hours of our lives, but it is what the people of cirque live and breath on. Where KOOZA performers take a break. There are couches, carpets and a TV showing the stage in real-time. The first order of business was a quick chat with Dean Harvey, Kooza’s American artistic director. My group settled at the troupe’s “pre-game” spot. Couches and carpets laid in front of a screen, showing a live feed of the stage. This is where they ready themselves moments before they get on stage, committed to their death-defying acts. 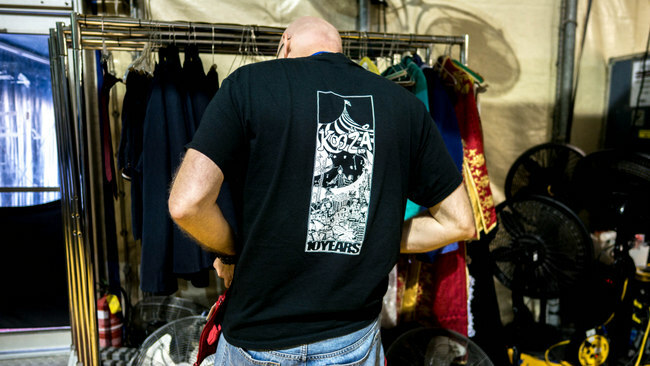 Dean Harvey, Kooza’s American artistic director will be in charge of the Singapore leg as well. Dean greeted us with a wave of energy. All smiles, and full of jokes. Even when we got down to business. Straight off the bat, I asked, what makes Kooza so different? His face changes to one full of endearment, as he explains. 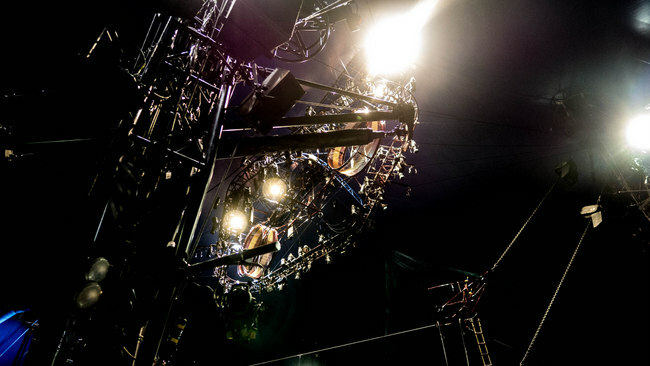 Kooza is more than just the technical marvel and pyrotechnics people have come to know Cirque for. 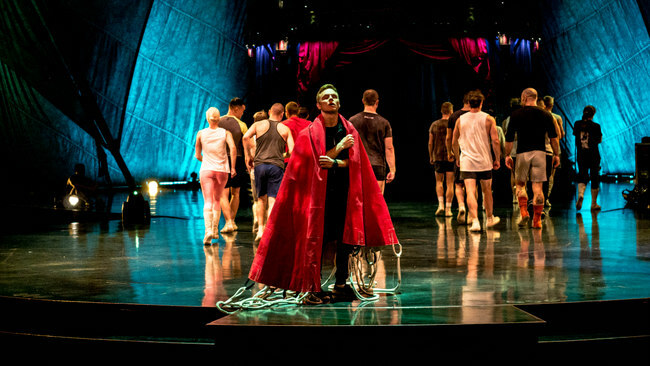 Kooza takes the audiences back to its roots. It will pay homage to the more traditional style of circus, where the story is the main star, the clowns are back with all their hilarity and daredevils with their terrifying tricks. It is a stripped down show, focusing on the performers. 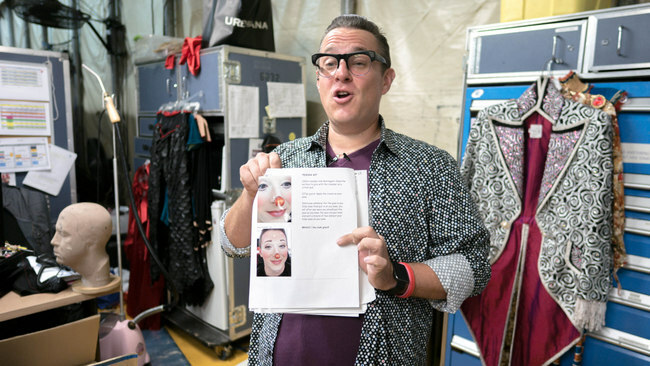 Jason Brass talks us through the intense amount of work each performer does to achieve the Kooza look. With the focus all on the individual performers, the costumes has to be just as stellar as their talents. 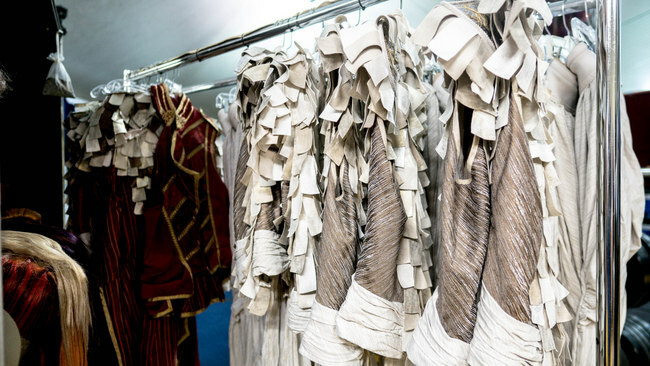 I took a quick trip down memory lane to my previous Cirque du Soleil experiences, whether in person or on Youtube, and remembered how I was always taken aback by how stunning the costumes are. They easily put any broadway production to shame. 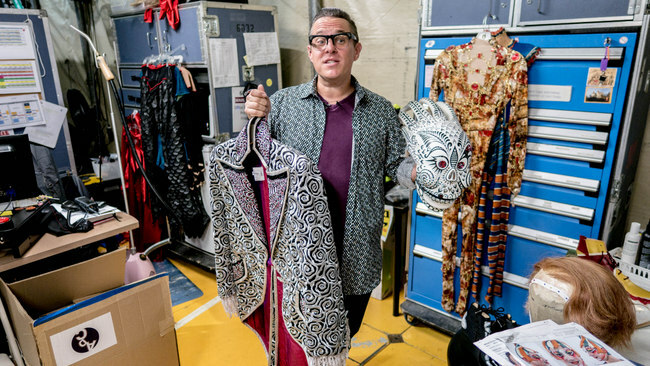 I got the chance to get up close to some of the costumes of that night’s show with Jason Brass, the show’s head of wardrobe. A stage head helps to ready the wardrobe needed for that night’s show. Working all day, up the moments before the show, making sure every piece of clothing is perfect. He knew what we loved and pulled out the most spectacular. Inspired by Dia de Muertos, a Mexican holiday known as Day of the Dead, it was a stunning suit covered completely in glistening beading. It was more than just a design. They had to make sure that each thread, each button and each bead on that suit stays on throughout the entire show as the performer dances (a full on can can dance, if I must add) from one end of the stage to the other. Michael Jay Garner sets up his make up corner, where he will transform into the hilarious Handyman clown. Even the make-up! 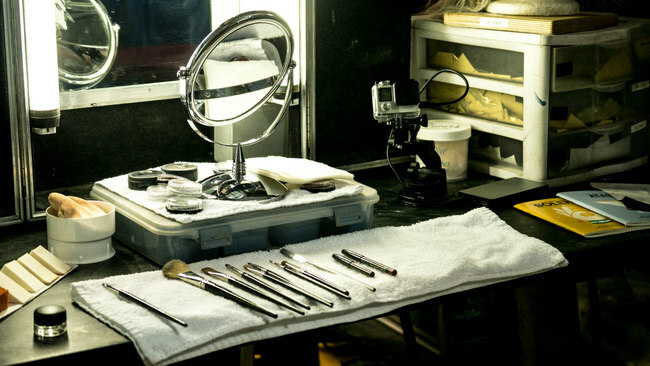 Oh, the make-up! Each look comes with a how-to sheet, complete with photos and specific directions. You’d think they’d let loose, thinking we, the audience, won’t notice from so far away, but, no. 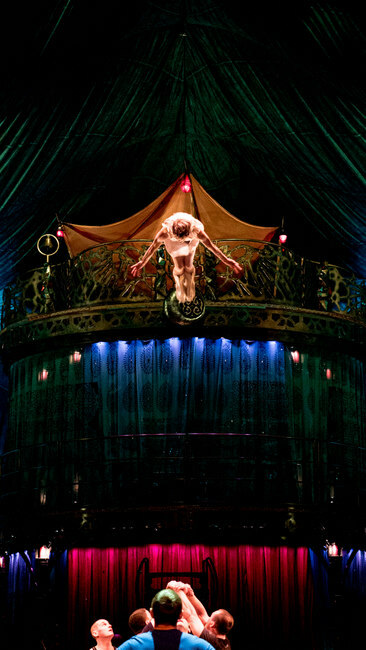 Cirque du Soleil is known for getting close to the audience, engaging all of us. So, they take absolute care and pride in how they look, immersing us in their magical world! I have a whole new level of appreciation for their craft. That is, until I saw their actual rehearsals. Jimmy Ibarra and his team rehearsing for the terrifying act known as Wheel of Death. It was hard to look, yet hard to look away. We had a quick chat with some of the performers, and they all admit to hating the safety nets and wires. You must be thinking, “No way, they’re crazy!” I thought exactly the same, especially as I watched Jimmy Ibarra causally skipping a rope atop a 725KG hamster wheel of death. They are trained professionals, and I’d trust them to do what is best for their performance. But, I can’t help watching them with my eyes half-opened. 100% committed, even during their rehearsals. Always smiling and ready to chat, it is hard to believe that just seconds ago they were flying through the air! Many of them are circus performers, learning their craft from young. Take Jimmy for example. He mastered the insane Wheel of Death act from his father, and his father from his. Generations of precise craft, passed down. Some are athletes, gymnast from young, who continued their career at the illustrious Cirque du Soleil. 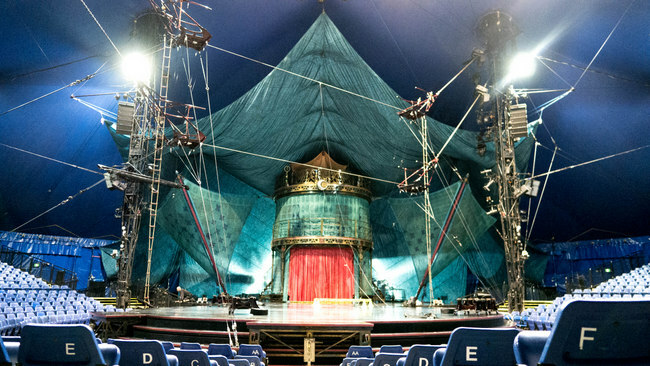 The back of the tent is filled with performers working out and practising their key acts, up the moments before the show. I spent hours, behind the scenes, mostly watching them rehearse. More and more performers came through the door as evening rolled around. Some started warming up with weights as heavy as me, while some started on their make-up. Rushing, too. Micheal Jay Garner, who plays the Handyman clown, takes up to an hour and a half to complete his entire look! But, there won’t be a performance without fuel. 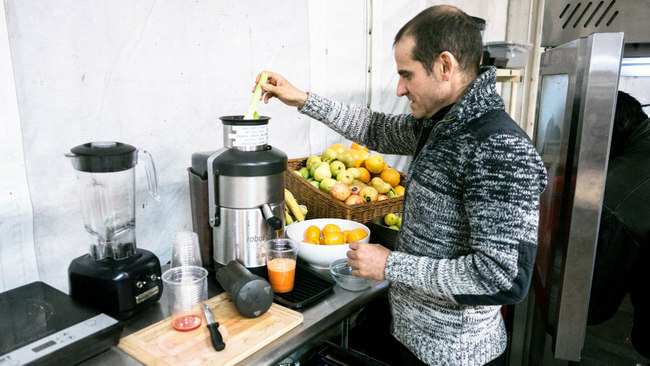 A booming kitchen filled with tons of healthy options for the performers of Kooza. This includes a juicer and a fridge of fresh fruits! This is no mere cafeteria. The performers’ and technicians’ health are of utmost importance, and everything is taken into account. Gluten-free diets, low carb diets, and everything under the sun, the kitchen is ready to provide. There is even a pricey juicer with fresh fruits on the side for a fresh cup of vitamins any time of the day. It is crazy how much detail goes into every nook and cranny of their operations! If you think Cirque du Soleil is just another circus performance, simply shocking you with moments of their death-defying tricks, you’d be proven wrong. Every thing on stage, every night, is a collective clockwork of the troupe, the performers’ culture and tradition and a never-dying thirst for perfection and to perform. It all translates to every second in the show. You can’t say you’ve lived till you’ve been to one of their shows! Check out Cirque du Soleil Kooza as they make their inaugural stop at Singapore. They will be performing at Bayfront Avenue from 12 July to 20 August 2017. Tickets can be purchased here.